Successfully Added Full HD 1080p Media Centre - Bit Torrent Ready + HDD Enclosure to your Shopping Cart. This is the ultimate home entertainment system. It is the think tank of all media tanks. Powered by a Realtek 1073 chip and housed in an aluminum casing. This HDD multimedia player handles up to a 2TB HDD hard disk drive and supports several display resolutions that include 720P, 1080i, 1080p at (1920X1080). 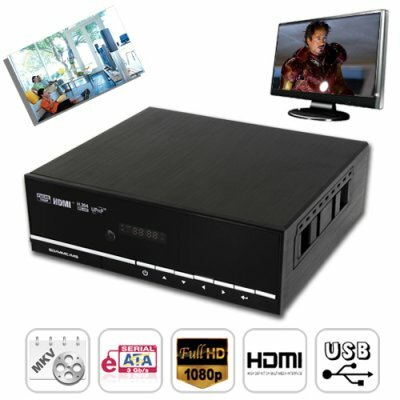 Although this 1080p Media Carrier is designed to allow users to implement a much more efficient media system in their homes, it is also designed to meet the user's expectations in providing a simpler and convenient method of accessing the internet directly without the need of a computer. This Media Centre enables the user to access websites such as Youtube and RSS news feeds directly on their LCD TV with ease, speed and efficiency, thanks to the onboard Ethernet port which allows user to connect this Media Centre directly on to the internet. What is Bit Torrent? BitTorrent protocol allows users to distribute large amounts of data without the heavy demands on their computers that would be needed for standard Internet hosting. A standard host's servers can easily be brought to a halt if high levels of simultaneous data flow are reached. To learn more about BitTorrent visit [http://en.wikipedia.org/wiki/BitTorrent_%28protocol%29]. This HD 1080p HDD media centre offers a versatile infrastructure that enables the user to merge all of their precious digital contents such as music files, video files and image files onto a single location for a more enjoyable experience, and also helps users keep their files organized in this mother of all media tanks. This media home entertainment center comes with a composite video port, component YPbPr port, HDMI port, optical fibre audio port, coaxial, 5.1 channel audio port, Stereo L-R, Multi-interface output, supports projectors and TV (AV) composite video. This media centre supports up to 15 of the most popular video and audio file formats which include MPEG, RMVB, AWV, MP4, MOV, MKV, FL, DIVX, AAC, MP3, WAV, WMA, FLAC, OGG and ASF. This Full HD 1080p media entertainment centre comes integrated with a web server called Neighbor Web, after you've connected your the Media Carrier onto you network (LAN or WLAN), get the IP address of the player under SETUP > NETWORK menu. Then type the IP address (e.g., 192.168.3.15) in the address bar of the Internet Explore on your PC, after this step is completed, just log in using the included user name and password that is provided in the included user manual, and access the Web server on your PC. Directly available from Chinavasion, this hi def media system is in stock now. Click "Add to Cart" now and we'll express ship you a sample to experience how awesome the technology of tomorrow feels right in your hand today. Brilliant HD output quality, & exceptionally smooth performance in ever aspect of its features and functions. When I switch to Y/Pb/Pr 480p, 576p, 720p, 1080i, and 1080p, does the TV screen display an unwatchable picture? Please check if your TV supports Y/Pb/Pr 480p, 576p, 720p, 1080i, and 1080p output, if your TV does not support, please use the A/V signal display instead, press the TV SYSTEM button on the remote control, then switch the TV’s video input to NTSC or PAL. I cannot see files shared on my computer via Browser->Network menu. - Please share the folders which you wish to browse on your PC, and make sure that ‘Everyone’ or ‘Guest’ has the right to access. I configured everything correctly, but still cannot get the wireless network or UPnP function to work. If you have a firewall, it may need to be configured or have exceptions created to allow you to see and communicate with the player on the network. To test if your firewall is preventing network communication (including PING and access shared folders), try disabling it to see if you can connect. If you can connect with the firewall disabled, you may need to add the player to the ‘Trusted’ list or configure the firewall for local intranet access. Does the CVPN-HD04 come with an HDD (Hard Disk Drive)? No, the CVPN-HD04 does not come with an HDD. Well I ordered 3 of them, lightning fast delivery as always, no problems. ordered thursday, received wed, in california. on 2010-11-04 12:39:47 100% Satisfied!! I've owned several Sigma based media players but this is by far superior. Menu system and remote access through IE is extremely user friendly. I installed a WD 500GB drive in 30 seconds with no issues. Can view all hard drive contents via Windows Explorer as well as move files via my network with ease (vs. Unix based systems). Bravo! This is a nice unit but this is the first time I have had to install the SAMBA file on a hard drive to have a unit access the network. There is no need to install any software to access the unit. The unit itself is great and it was exactly what I wanted. on 2010-08-27 23:08:29 Very close to perfect! This is an equivalent hardware of PLAYON! HD but better built quality with case and layout. It plays 1080p wmv, mkv, xvid flawlessly. Even my Pentium M 1.5GHz with Mobility Radeon 9700 can only stare at such HD files. But nothing perfect, mp4 format of just 720p video file can be played. I really satisfy with its hardware performance.